Starting this discussion thread off with some gifs and commentary, yo! How did Hard Drive even manage to steal that tank without his surge suit? "No, no don't film us actually apprehending a villain for once. Only broadcast our failures at length." "Hey there, whatcha doin' doc? You already fixed us up!" "Not quite my friends. When I activated you I did not know you had gangster personalities. So I am going to use these disks to 'reprogram' out your criminal tendencies. Or, as my colleagues on the scientific ethics council would call it, I'm going to murder all that remains of who you really are by cybernetically lobotomizing you against your will, wahaha! It's still legal to execute criminals without a trial, right? In any case, if they think skinning drowned convicts to make fur-suits out of their flesh and implanting their brains in robot bodies without the consent of them or their families and then brain-washing them into being my servants is bad, at least they'll never find out what I did to Schrodinger." "Can you believe that? And they think we're bad guys!" "Can you believe he was gonna make you a chauffeur? HA!" "Hey, it ain't no stupider than you doin' housework. When's the last time you cleaned anything?" "I can clean your clock, tough guy." Mac knows it's true, but then again, he knows the pants always looked better on Molly. An existential quest with Scaredy Kat begins as once again, our weary and unwitting hero is inevitably handed high level explosives. ...It is Chance's mind that is blown. "Chance! This happens every single time! LITERALLY! Why do you have to be that guy??" "HEY! What's the big idea, dumping all this trash on our doorstep?!" "Special home delivery for our favorite 'heterosexual' life partners!" "...HEY! I don't appreciate that!" "We don't need anymore rumors flying around, darn it!" We all know what scene I'm talking about..."
"...Straight or curved, everybody already knows we're pretty married." Anyway, this part of the episode is one of my favorites in the whole series. How cool would it have been to have seen them be forced to take on more missions as mechanics? Fun fact: one of the "technical" descriptors here is "CORPSE MAGGOTTS". But honestly, below is one of the most gloriously animated action scenes in the whole series. *applause* Also, no tails. Whoops! At some point, I'm literally just going to make a whole thread filled with sweet looking Turbokat gifs. And the most senile of SWAT Kat villains is saved! That's all I got for this ep, but am open for requests! Stay classy! Ever notice the SWAT Kats accidentally get two Enforcers killed? When Feral is in his tank, we see there's two nameless commandos in it with him (Feral calls one of them "sergeant," but neither is our boy the Sarge). When Hard Drive loses control of the Behemoth thanks to the Scrambler Missile or whatever, it runs over Feral's tank. We see Feral leap free - but not the two guys we saw with him! The Behemoth smushes the tank into mincemeat, clearly killing both Enforcers outright. There's even a bit later where we see Feral standing there staring angrily at the crushed remains of his tank... which has got to have the mangled remains of his two men inside of it. What's funny is that in an effort to avoid upsetting the kiddies, he doesn't bring it up in his angry tirade against the SWAT Kats when Ann interviews him. 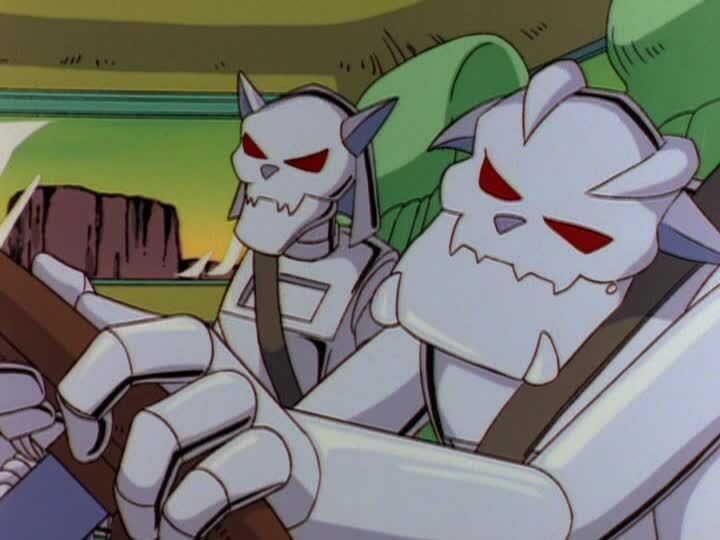 Consequently it makes Callie's line "They care enough to have saved this city again" seem way more than a little callous because, dude, the SWAT Kats totally accidentally got those two guys crushed by an out of control experimental death tank! A similar thing happens later during the Macrobot battle. The Metallikats put Razor's Macrobot through a skyscraper, almost completely destroying it (the building, not the robot). So, unless (to paraphrase Dub!Vegeta) it was Sunday and that building was entirely empty, then, uh, yeah, that just killed a buttload of people. Metal Urgency slickly glosses over some pretty high civilian collateral damage of right there. I guess the difference is we don't see the innocent office workers and janitors and whatnot beforehand, like we did the subway commuters in The Giant Bacteria (and the Enforcer tank crew earlier), so it tends not to come off as too gratuitous. LOL I guess I never really sat and thought about how crazy Hackle's idea there was... Though he used synthetic skin for them, thought it was a good likeness. Guess they did too as they took and wore 'em, least for a little while. There certainly was some great animation on this episode for certain. Nice gif set to capture it! That is one heavily-armed vehicle. It has a minigun and missile launchers? Better to be overprepared than underprepared I guess. As far as Burke and Murray's idea, well... one can always speculate. He climbed in through the open cockpit bubble...? Also, notice the hookup for the helmet moves around on the control panel... an odd error. Oh, and the way he's moving and will all the flashing lights it looks like he's in some kind of malfunctioning futuristic DJ booth. Part of Mac's chin doesn't move with the rest of his head when he turns it. Yes and know. While it'd be cathartic, he has Enforcer training and they just haul scrap. Burke is big, sure, but he probably isn't a very good fighter, so it'd be incredibly one-sided and I'd just end up pitying those two doofballs. Especially Murray. Burke's size means he conceivably stands a chance at getting in a few good shots, but his brother? I can't imagine any universe where that midget could beat up anyone. Hahahaha, well, speculate one may personally, I don't think they're entangled in that way, but it's still ripe for humor and baby, I'm gonna exploit that. In terms of logistics that get in the way of them actually being able to foster romantic relationships as vigilantes, they'd have a better shot being more than bros than they would with any of the gals they know. ...so, no one has anything to say about the SWAT Kats definitely indirectly killing two Enforcers when the Behemoth flattens Feral's tank? There's definitely some blame to be laid at their feet because it only happened due to Hard Drive losing control, which they caused. I forgive them since it isn't like they knew it would happen, but, still, it's something that is never acknowledged - not even in the episode itself as I described above. It's just brushed aside. 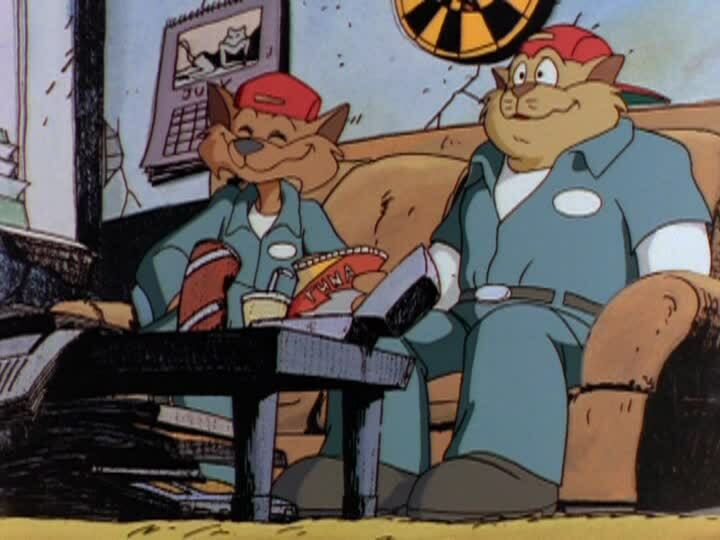 Even if nobody blamed the SWAT Kats, it's weird how those two guys' deaths are just swept under the rug and Ann's news report is all hap-hap-happy the-day-was-saved and not even Feral, who was clearly looking at the crushed tank, brings it up, when you'd think he of all people would use it as fuel for the anti-SWAT Kat rant that inevitably follows Ann jamming her microphone in his face every time. I get not wanting to address it directly, but why have such a thing occur if it's going to have no impact on the plot...? This entire thing could've been avoided if either A) we hadn't been shown the men inside at all, or B) we'd seen them bailing out with Feral. They're inside that flattened hunk of twisted metal! They're in there! And Ann and Callie are smiling! This bothers me so much! I wanted to bring this up in an all encompassing Enforcer thread, but I really hated that Feral is protrayed (and consider by show proper) to be a jerk for bring up things he's supposed to care about. Expect to others to abide by the law, as the SKs even existing is a very blatant contradiction of that. I know this is the SKs show, but the above is Feral doing his job. The same job a deputy mayor snootily tells him he's not doing. Why is he a jerk for being concerned about damages, or that his orders be fulfilled? Isn't he supposed to care? I guess if he didn't, he'd be called out for not doing so. If the writers wanted him to be considered a jerk, then let him be a jerk. Show us abuse of power. Show us laziness and not caring about the public. But everything presented by the show regarding is the antithesis of being a jerk. He's a guy who cares. Boisterous, sure. But a jerk? Maybe the writers shouldn't have made Feral a Commander if they wanted someone who calls out things to be a jerk. Maybe a bean counter accountant under Callie? But even they would be right, and only annoying if they harped on everything, not just a right call out. Side note: It's maddening when Feral should have response to defend his troops, himself, or rightfully call out the SK's reckless behavior, he's rendered mute. As Koosh point out, this would have been the time to point out his troops were harmed. And going back a few episodes, he should have immediately been able to defend himself to Callie. But nope, can't have that. We wouldn't be able to get a mean spirited shot/joke at Feral if we did that. AkaneKitty wrote: Maybe the writers shouldn't have made Feral a Commander if they wanted someone who calls out things to be a jerk. Maybe a bean counter accountant under Callie? I now have a mental image of Feral as a CPA. With glasses and everything. And still being ripped as heck! He'd be, like, the buffest petty office bureaucrat ever!